My friend and great DI Kelly Nelson has a new Therapy Guide for using sensory bottles with toddlers. In the 37 minute video and 13 page written guide, you’ll find SUPER ideas for making and intentionally using sensory bottles with toddlers and young preschoolers. These activities go waaaay beyond giving a child something pretty to look at! Activities are listed for all of the developmental domains including language, motor, social, cognitive, and of course, sensory needs. The video can be purchased for $11.99 and viewed immediately online using the link above, or it’s available on DVD from our online store at www.shop.teachmetotalk.com. 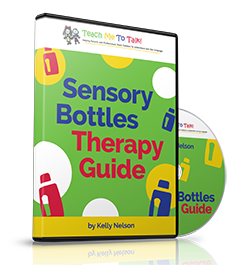 Click Sensory Bottles Therapy Guide to purchase.